The 430 Books in Marilyn Monroe's Library: How Many Have You Read? | Open Culture The 430 Books in Marilyn Monroe's Library: How Many Have You Read? If you’re a reader and user of social media, you’ve likely tested your lifetime reading list against the BBC Book Quiz. Or perhaps you've allowed your worth as a reader to be determined by the number of Pulitzer Prize winners you've made it through. The National Endowment for the Arts’ Big Read, anyone? The 142 Books that Every Student of English Literature Should Read? The 50 Best Dystopian Novels? Being young is no excuse! Not when the American Library Association publishes an annual list of Outstanding Books for the College Bound and Lifelong Learners. So… how’d you do? Or should I say how’d you do in comparison to Marilyn Monroe? The online Monroe fan club Everlasting Star used photographs, interviews, and a Christie’s auction catalogue to come up with a list of more than 400 books in her possession. There is, within Monroe’s image, a deeply rooted assumption that she was an idiot, a vulnerable and kind and loving and terribly sweet idiot, but an idiot nonetheless. That is the assumption in which ‘Marilyn Monroe reading’ is entangled. The power of the phrase Marilyn Monroe reading’ lies in its application to Monroe and in our assumption that she wouldn’t know how. Would that everyone searching that phrase did so in the belief that her passion for the printed word rivaled their own. Imagine legions of geeks loving her for her brain, bypassing Sam Shaw’s iconic subway grate photo in favor of home printed pin ups depicting her with book in hand. See below, dear readers. Apologies that we're not set up to keep track of your score for you, but please let us know in the comments section if you'd heartily second any of Marilyn's titles, particularly those that are lesser known or have faded from the public view. Methinks Eaton doth protest too much. The phrase “James Joyce reading” yields 59,100,100 Google search results. Are we to conclude that Joyce was an even greater idiot or novelty? Would she have married Arthur Miller if she had no literary interests? Pictures of women reading are inherently attractive to literate men. That’s the simpler explanation. Joyce Cary was a man, and therefore his book Mr Roberts should not be listed under Women Authors. Sorry this was not intended as a reply to andrekibbe but as a separate comment in its own right. Joyce Cary was a man, and therefore his book Mr Roberts should not be listed under Women Authors. An easy mistake to make though. I saw an article once that discussed how Marilyn Monroe and Carl Sandburg were close friends, to the point of it being a father-daughter type relationship. If that’s true, it’s curious she only had his Lincoln biography, and not any of his poetry collections. The Autobiography of Lincoln Steffens has been a favorite of mine, and would be up for props from me. Wow. This list is the opposite of diverse. I’d rather broaden my horizons, thanks. I was a huge Marilyn fan when I was a teen. I remember trying to read Anna Karenina then because she was such a fan of it (but I did not get far at age 13:) She wanted to play that role, but was basically told it was over her head. Which was wrong, because she was also a great dramatic actress, though we remember her more for her comedies. Acting involves intelligence, and frankly, Norma Jean Mortensen’s greatest performance was the role of Marilyn Monroe. She tricked everyone. I think Marilyn probably read a good number of the books she owned, in likelihood, given how often she was seen to be reading, to be photographed reading, to have a book in her hands in downtime. She wasn’t doing it for her image – she was quite intelligent from what I’ve read of her. I love the photographs of her reading. That’s horrible photoshop job on the book she’s holding. Joyce Cary was a man, “hanialtanbour.com/books” and therefore his book Mr Roberts should not be listed under Women Authors. An easy mistake to make though. Rafael Alberti and Federico Garcia lorca are American poets? OMG!! !… they are spanish poets… Spain, the european country!! …and Rainer Maria Rilke is -just a little- Austrian… not American… in Europe, too. I’m about to get started. 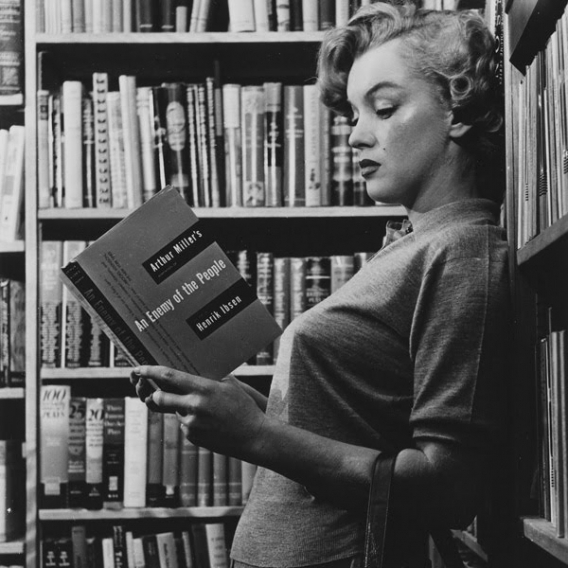 Marilyn was reportedly a voracious reader. Due to her high IQ, she didn’t always finish books after she had surmised its meaning because she could predict its conclusion. I’m astonished that none of Truman Capote’s collected short stories are among her books.